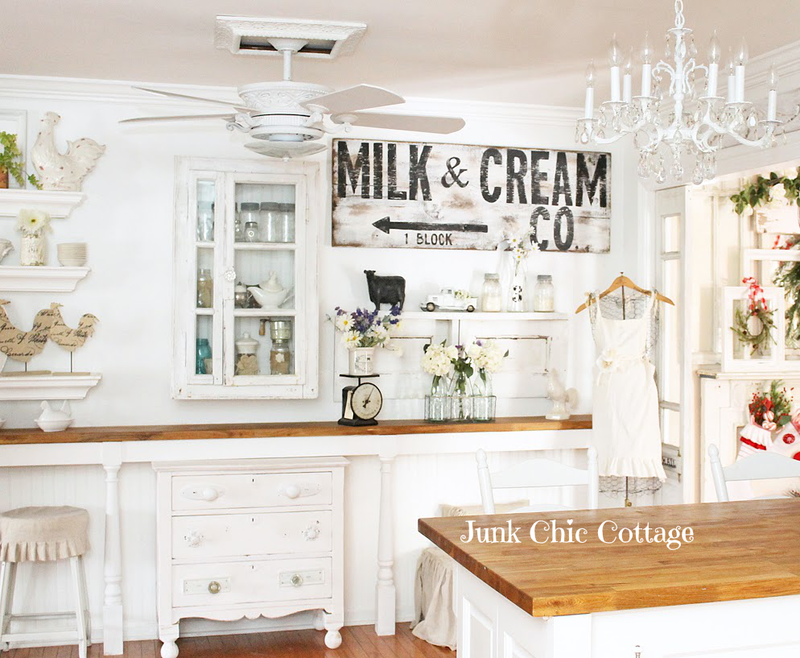 I am doing the happy dance and cannot wait to show you part one of my french farmhouse kitchen wall and china cabinet re love. This was the long wall in my kitchen. I got my china cabinet back from my daughter and thought I would somehow make it work on this wall. Well that started a whole thing. We took everything down off the wall. I was just going to paint the wall and then bring in the china cabinet and paint that and work some decor in around it. 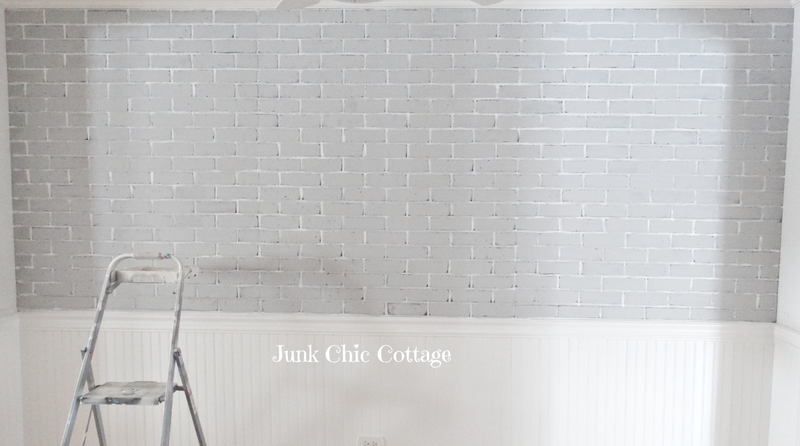 After seeing sweet Pamela's faux brick wall from My Front Porch To Yours and a few other tutorials on Pinterest, I decided to go for it. 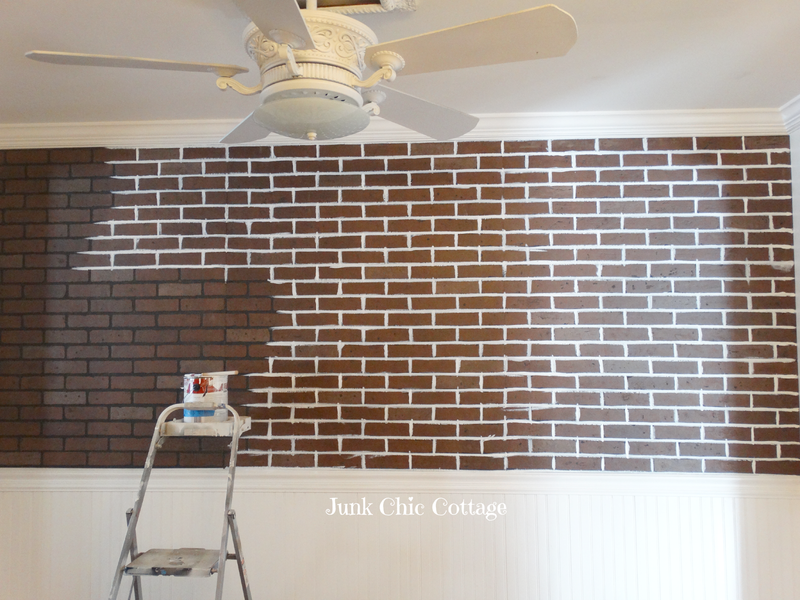 Here is the step by step tutorial on how I did my Faux Brick Wall. 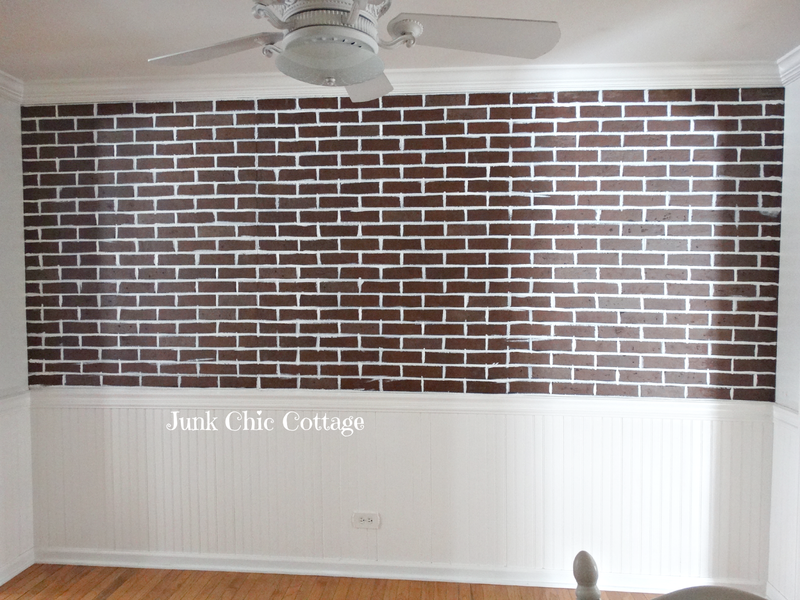 Terry and I bought these faux brick panels from Menards. You can get them at Lowe's too. They were $22 a panel and come in 4X8 panels. Our wall took two panels. After Terry cut and fitted the panels to the wall with a nail gun. I began to paint all the grout lines from black to white. Just used white latex paint I had. If you get a little on the bricks it is ok since there are more layers of paint to come. It looks tedious but it really wasn't that bad. Maybe 30 minutes to do this whole wall. This is step one finished. I know it still looks like grandma's basement but just wait it gets better! 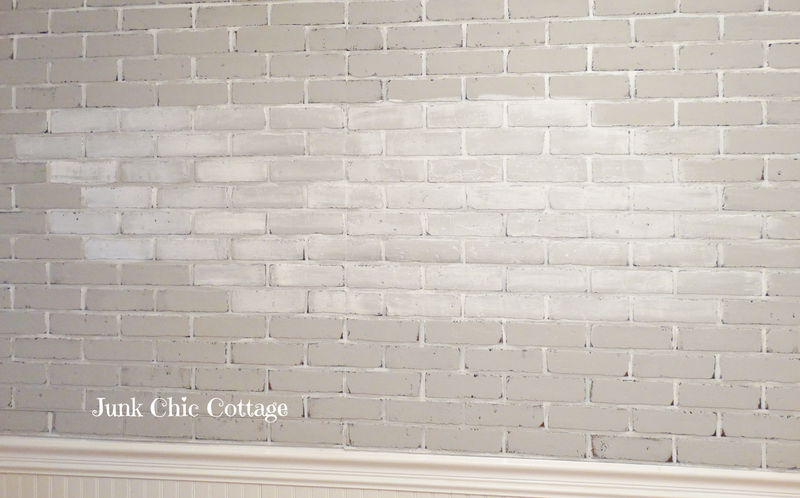 Step two was to use Annie Sloan Chalk Paint on the bricks. I used Paris Grey watered down just a little bit. About 3 parts paint to 1 part water. I used a regular paint brush to put the paint onto the bricks. Terry and I worked on this together. We both started at each end and worked to the middle. It goes so much faster when you have a paint partner!!!! We did the pyramid method. Not sure that is the "technical" term but that is what I called it. If you paint in uneven rows like this your seams are easier to hide. Ok after putting on the Paris Grey Chalk Paint it looked like this. So now step 2 was done. 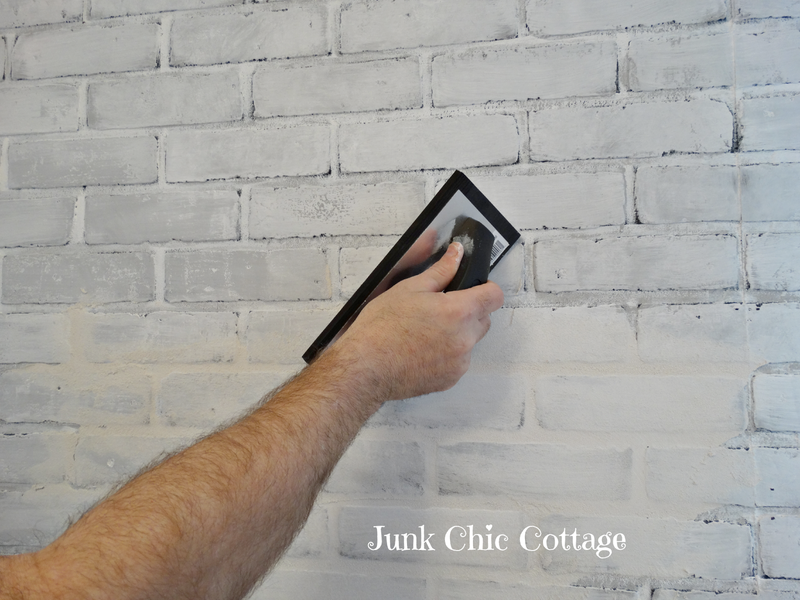 Step 3: White washing the brick. I used regular white paint for this step. You could use chalk paint too but I just used what I had and it was white latex paint. I brushed a section about the size you see above in white paint (did not water down the white latex paint) and then took a damp cloth and blotted over the bricks. This way some of the grey came through to give that old weathered brick look and a variation to the color of each brick. This is fun because you can control the amount of white that shows and how much grey you want to come through. 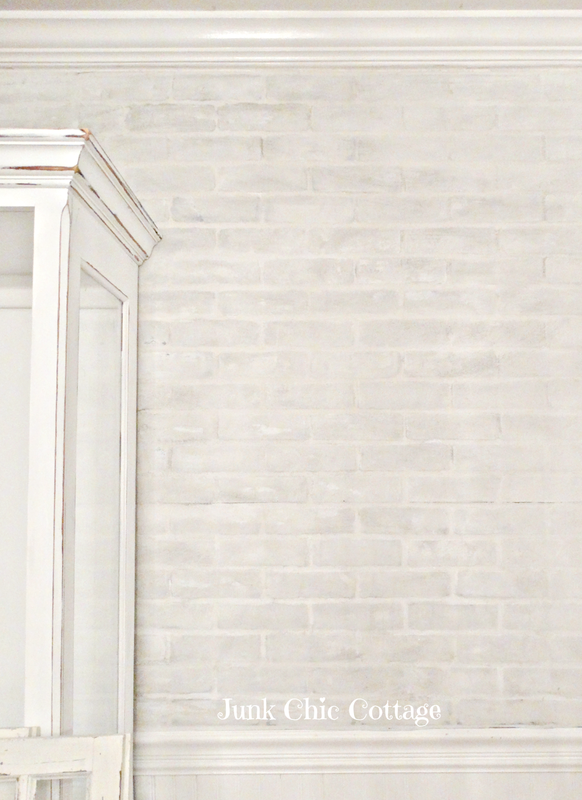 I used Paris Grey chalk paint for the base coat and Behr white latex satin for white washing. I wanted this color combo to go with my white and grey french decor in the kitchen. You can use any color combo's you like. I know Pamela used a few different colors throughout her bricks to get a varied color look. I wanted a more weathered soft gray and white brick. 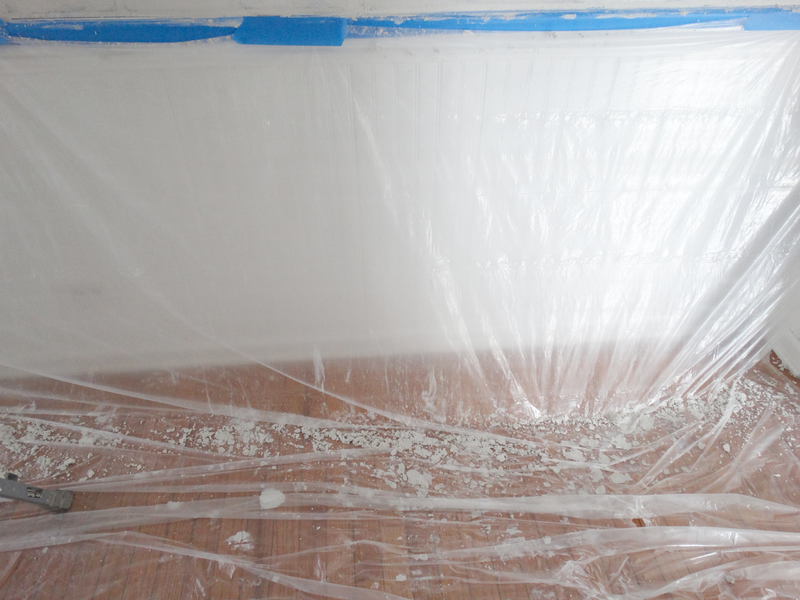 Step 4: We taped off the corners where the wall meets the brick and taped paint plastic drop clothes to the bottom of the wall onto the floor. This is really important to do because the next step I am going to show you is very messy. So this makes for easy clean up and protects the bottom wall and floor. Grouting the brick to give more texture and a realistic look to the brick. 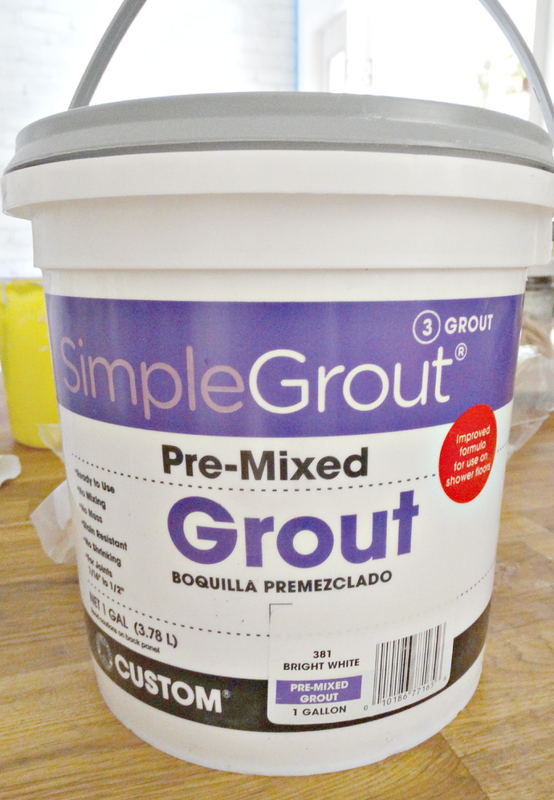 I got this pre mixed grout at Home Depot in the bright white. It comes in different colors. It says it is bright white but it really is more of an ivory. This large container of grout will run you around $24 dollars. It comes in smaller pints too for around $10 but we used almost all of the gallon for my half wall. Terry bought this rubber float for $5. 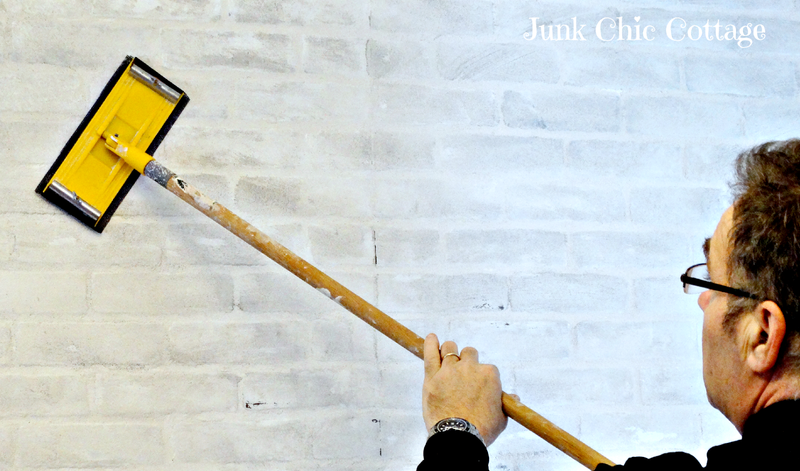 Totally worth the $5 to smooth the grout onto the bricks. Worked much better than a putty knife. 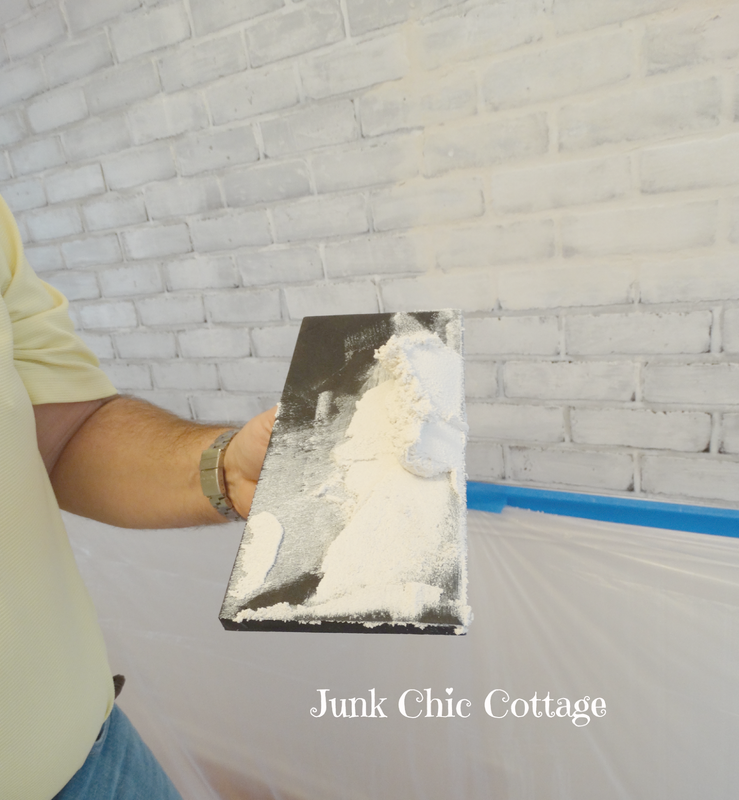 You can put on the grout with the putty knife but we found it to go on smoother and easier with the $5 float. We started from the middle of the wall and worked out. I do not think there is any specific way you have to do this. This was just the way Terry decided to start. 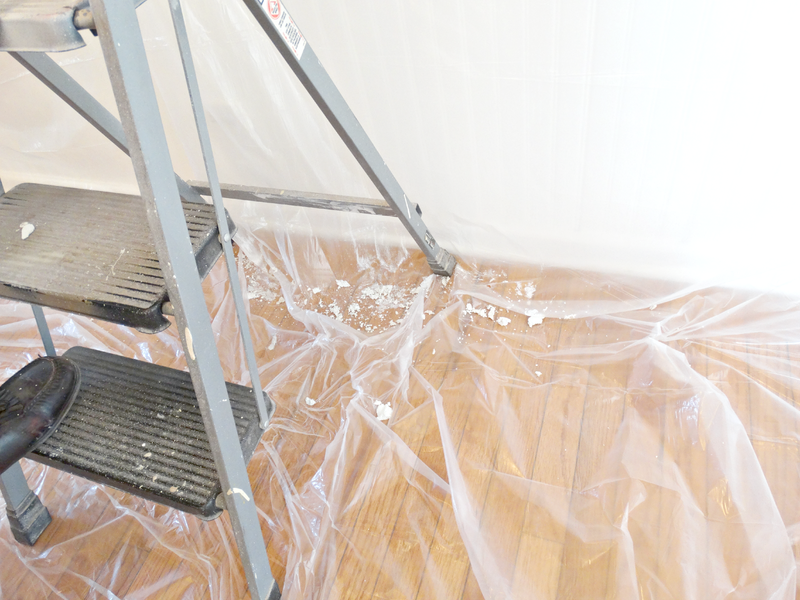 This is why you really need the plastic throw away drop cloth. It gets messy. The drop clothes are 4 in a package for $3. Yep very messy. Easy Peasy clean up with plastic throw away drop clothes. Grout completed. Let dry for 20 to 30 minutes. Up close of grouted bricks. The grout really gives the brick grout lines 3 D texture. So we took Terry's mouse sander and put a wet old cloth over the sander and ran that wet over the bricks. That helped to remove a lot of the access grout on the bricks. 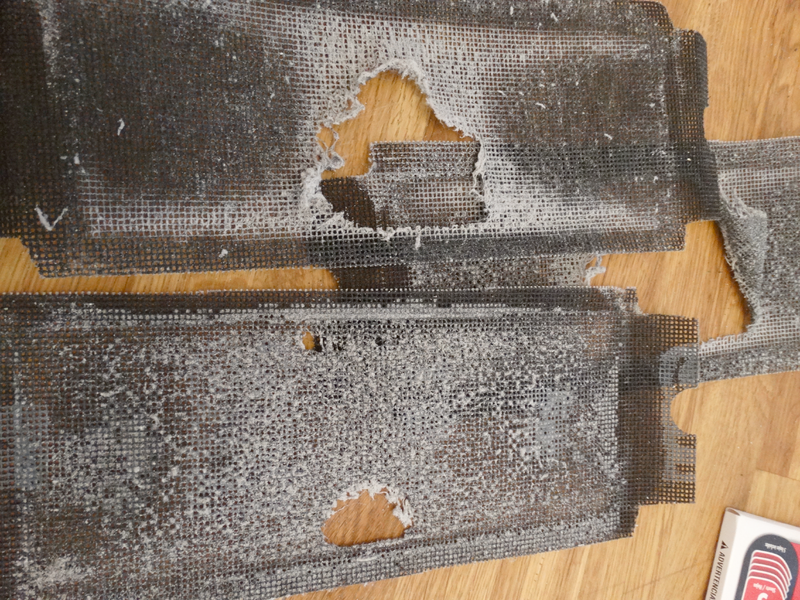 Next we took these Drywall Screen sheets that we attached to a pole sander. After Terry attached the dry wall screen to the pole sander I took a old wash cloth and got it soaking wet and then went over a small section of the bricks with the wet cloth. While the area is still wet Terry took the pole sander with the screen on it and sanded over the bricks. 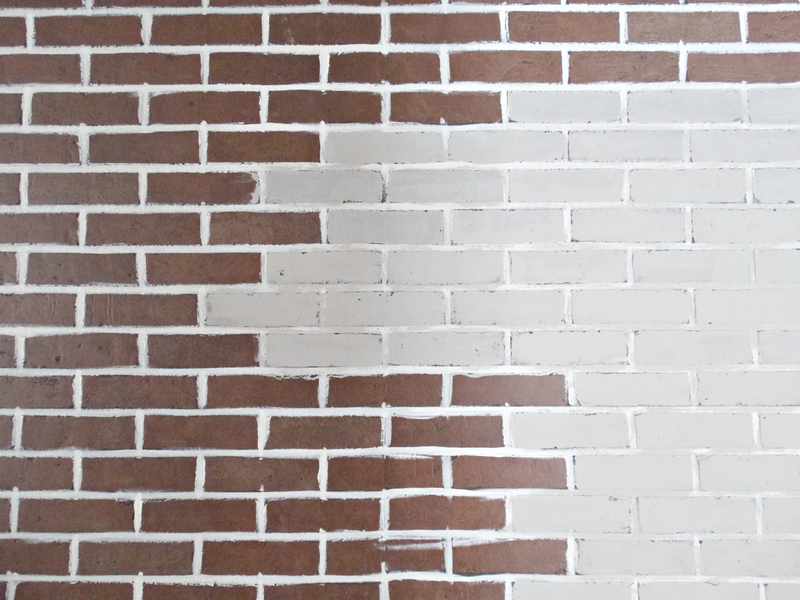 This worked perfectly to give the brick a authentic look and variation in colors. The bricks looked old and weathered. 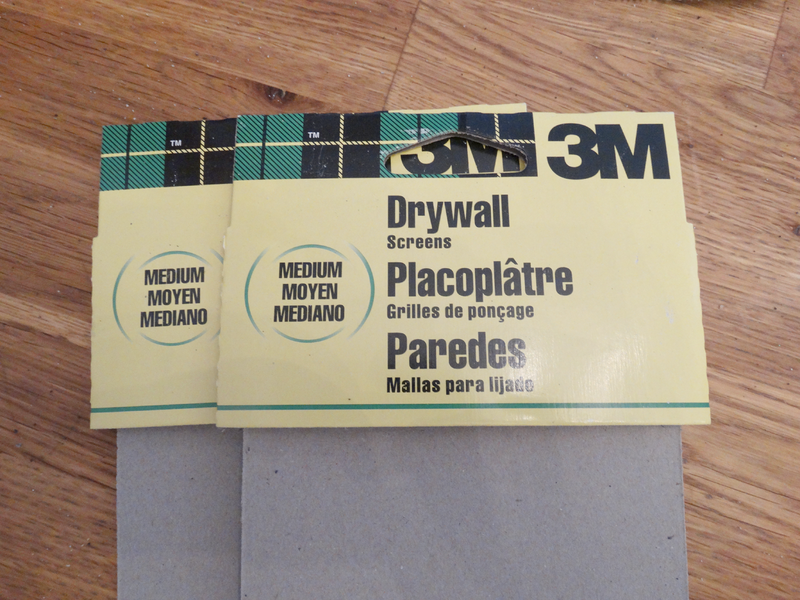 You will go through several sheets of the dry wall screens. They came 2 screens per package for around $3. We used 4 screens or 2 packages for the whole wall. 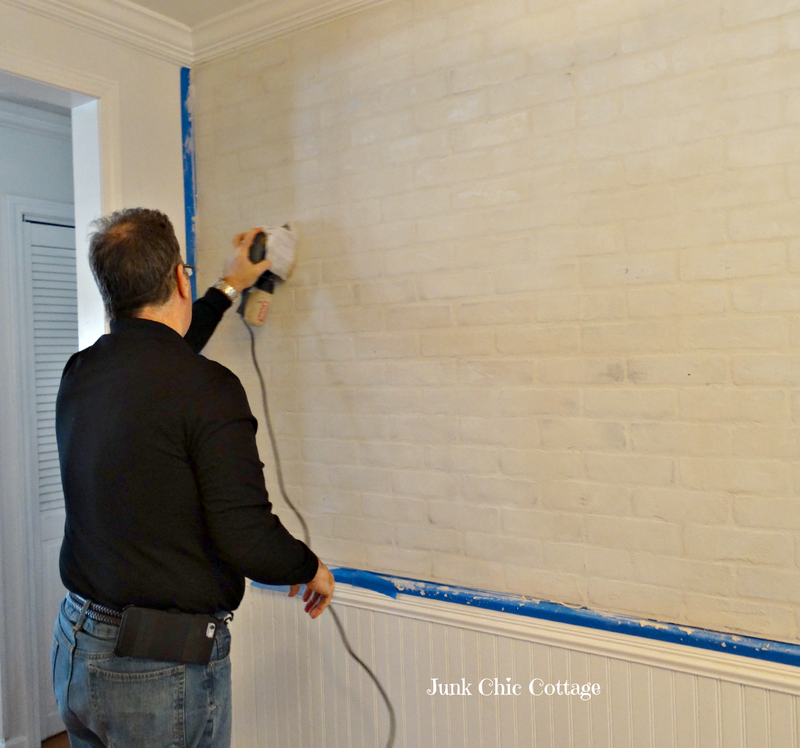 The dry wall screen on the pole sander makes the grout smooth out and makes the bricks look and feel weathered like real exposed brick would. So that is all the steps I did to get this smooth weather exposed brick wall. I love that the grays and whites come through in different areas to give a realistic look. The texture to the bricks feel real too. 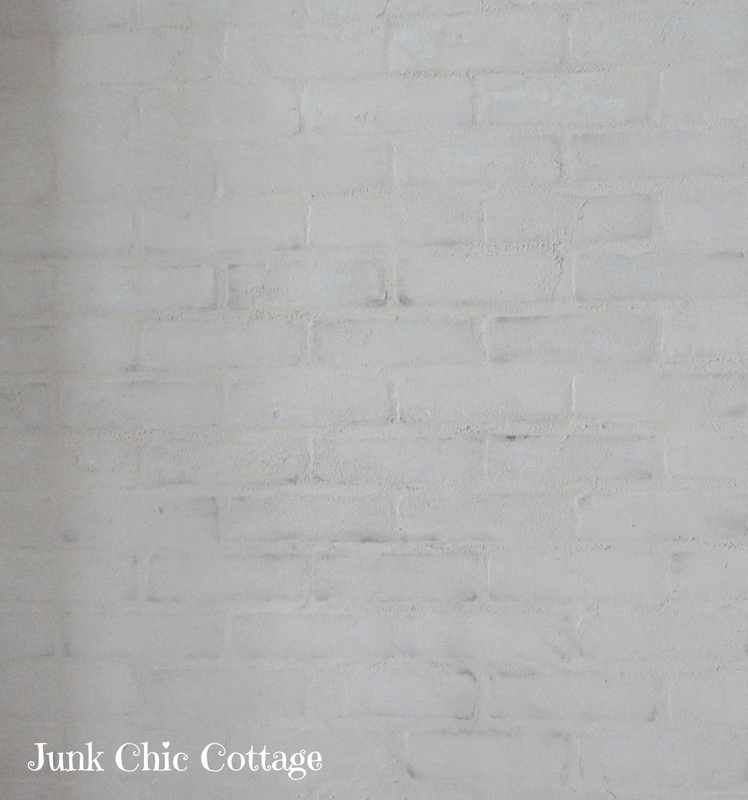 So this is my tutorial on my faux brick wall. I know you can get more involved with using plaster etc. to get an even more 3 D effect. For my kitchen wall I just wanted a weathered soft flat brick wall. I did not want a lot of uneven grout to stick out. Stay tuned to see what happens with this black china cabinet. Total transformation of this piece and some new "old" vintage cabinet doors are going to be re loved onto this piece. The mirrors will be gone. New vintage hardware will be added. She is going to get a total make over. 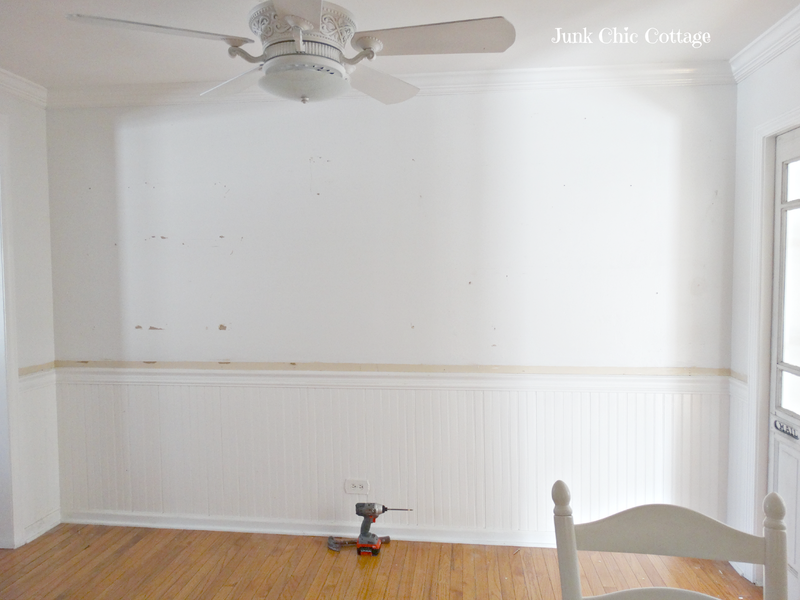 Hope to have a post on the cabinet make over and the faux brick wall behind decorated soon. Have a wonderful Sunday. We are getting bitter cold again here in Chicago land this week. Ughhh! Hope March brings in some warmer temps. The wall looks fabulous. I love it, and great tutorial. Can't wait to see the china cabinet too. Wow, Kris, just wow. Amazing results, and if the next to last photo is what I think it is, you're right - total transformation. You two have been so busy! Deep freeze, snowpack and winds won't stop you, now will it??!! Holy Brickwoman! (as opposed to Batman)..WOW! You did a fantastic job on that...and so did Terry! He is a great partner in crime for you. Hey- Tell him he is getting so skinny I thought you had a new boyfriend helping you out there! I absolutely love how that wall turned out. Do your remember the old days of Z-Brick when you actually put those thin little face bricks up one by one using adhesive and then mortared them in? It was almost impossible to get a straight line. The panels you used are perfect...and so is all the "doctoring up" you did to make them look real. Question: Because you went over the grout lines with real grout would you have had to paint them white first? Or would the old dark grey have shown through if you didn't do that step? Wow! What a transformation!! Looks amazing, Kris. You guys are a great team. Can't believe how quickly you got that done. Take care in the cold. You and Terry just amaze me! That wall is going to be beautiful. What a process! It is looking fabulous though. Can't wait to see the finished room! Y*O*U & Terry are definitely TV SHOW MATERIAL!!! OMG!!! ~ Unbelieveable!*!*! It looks beautiful, Kris! What a lot of work - I have to give you and Terry credit for sticking with this project. Can't wait to see how you cabinet turns out! Stay warm. We got lots of snow yesterday, which iced up last night and frigid temps again this week. Where are you Spring???? That wall is lovely. I was surprised you were going to take down all the beautiful things you had on the wall before, but now I can see why! Oh my goodness, this looks amazing!! You and Terry had so much work to do but it was totally worth it. So looking forward to the rest of the reveal! You never cease to amaze me! Terry is a sweet hubby to do all of that for you. My hubs loves to help, too. Yeah for these good men. Your wall is so pretty - and I can't wait to see what you do with your hutch and the entire wall ensemble. It's so much fun to visit with you and see what you are up to. Blessings for a wonderful week! Just when I thought there wasn't anything left to do in your home, you amaze us with another fabulous transformation, Kris! 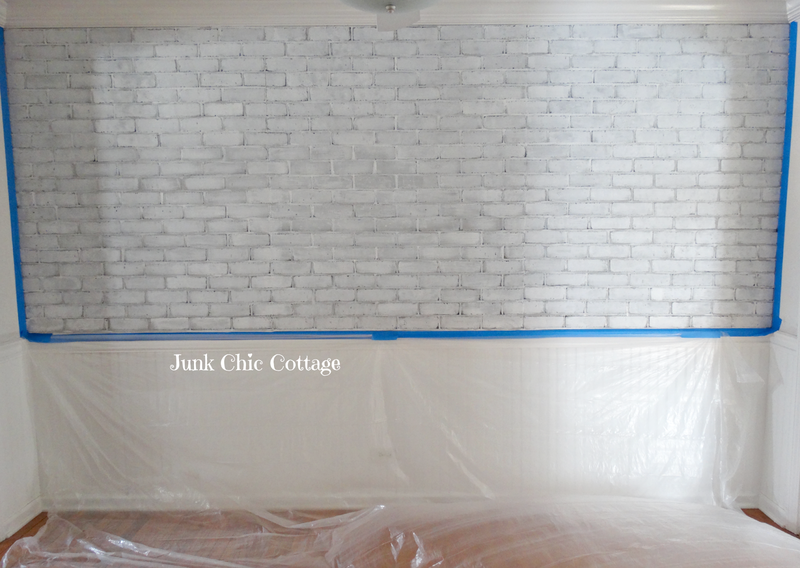 We used that brick paneling in the basement of our previous home, but that was way before blogs existed, so I just painted it with flat white paint and loved it. You've taken it to a whole new level! I can't wait to see how you transform your china cabinet! It's -20 and I'm not stepping outdoors today! Keep warm and carry on! 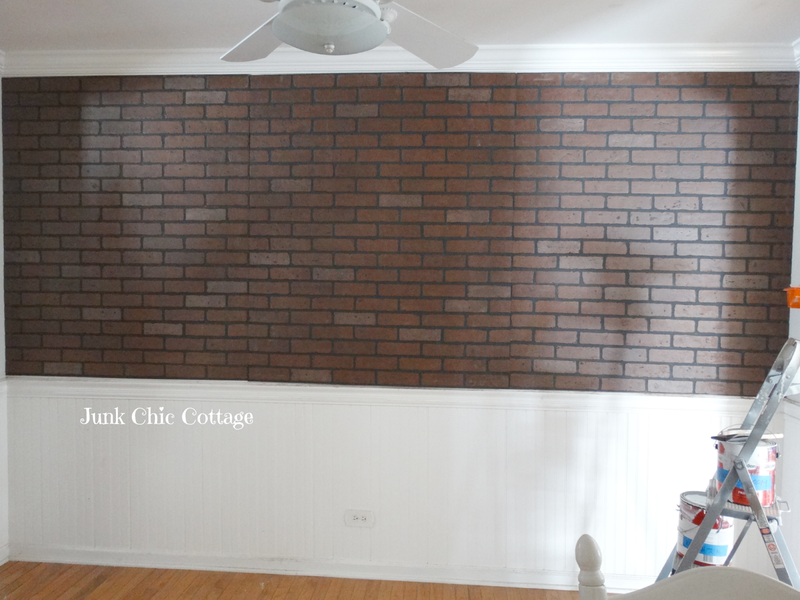 I am doing a faux brick wall in the breakfast nook.Thanks for the tutorial! Like you and Terry, Douglas and in work as a team. LUV it!! It is so cool, and it doesn't look like a basement anymore! It looks AMAZING!!!! 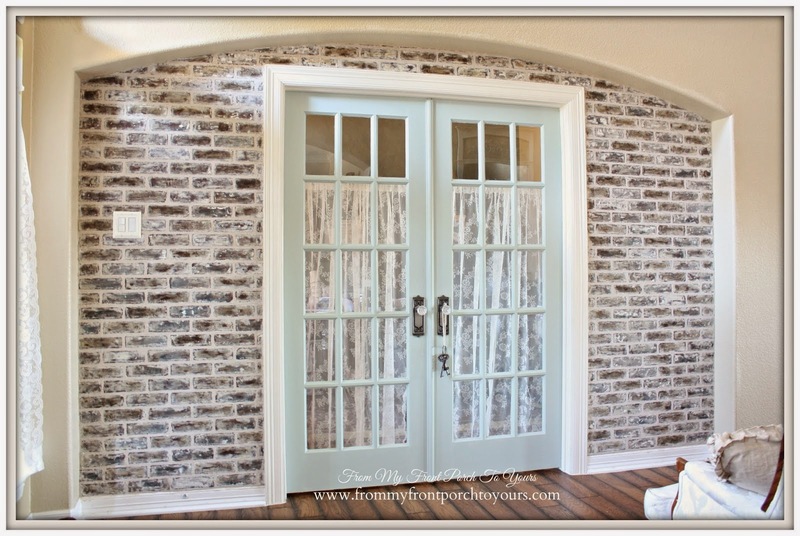 I would never guess it isn't a real brick wall.....I can't wait to see what you do with the china cabinet! Kris you and Terry truly are the dynamic duo of creative home renovations! You masterfully accomplished adding textural interest while adding visual warmth. Gorgeous! You and your tool belt partner, I am sure are transforming your cabinet into an amazing architecural piece. I'm thinking the mirror will be saved for another project very soon. You and Terry did a great job on the wall...love the colors that you used. Looking forward to the full reveal. WooHoo! Just as I suspected- it's spectacular. I've been dying to see this finished Kris and so happy I didn't forget to come by today ! LOVE - and though I told you I had done this 2 houses ago - you've now made me want to do it again - maybe in the dining room when we finally get around to it - it's beautiful !!! Fabulous job - the both of you are something else ! Well, I am impressed! Steve won't touch a paintbrush if it involves painting walls. I think it is because a paintbrush his the tool of his trade so he doesn't want to paint when he isn't working. Oh my that looks wonderful, I've seen projects on pinterest too that's peaked my interest. It does seem like a lot of work, but then it does looks like it is so worth it. It is so "charming" looking. A big shout out to you for giving credit where credit it due for your inspiration. Have you recovered from all the work yet? The wall looks amazing! Wonderful job!! Wow Kris....it looks amazing! I cant wait to see the finished project! That looks great! It looks like a lot of work but it turned out beautifully. Tons of applause here! You two really know how to roll up your sleeves. Looks wonderful. It will look fantastic no matter what is up against it. So excited for the decorations and ta da!! That looks absolutely fabulous Kris! I saw Pamela's wall too and loved it. Yours is looking just fantastic. I can't wait to see it all finished with that gorgeous piece of furniture. Cannot wait to see the finished room! 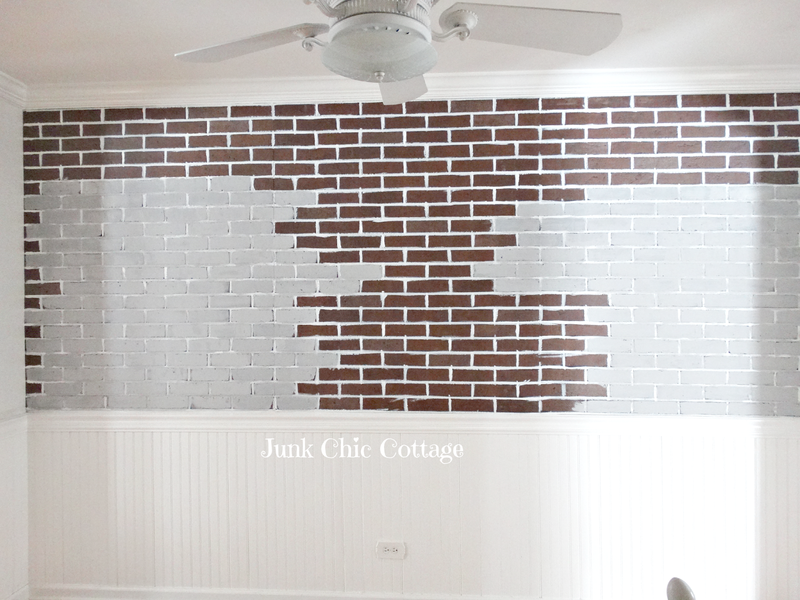 Wow, your faux brick wall turned out beautifully, Kris! What a labor intensive project, but so worth it! That is awesome that hubby enjoys getting into the act, too:) It really does have that French farmhouse look and feel! I love brick walls. We have 2 real brick walls in our house, and I like the "rustic" feel. I think your wall looks fantastic. Such a great addition and details. Looks fabulous Kris, but you have me worn out hahaha. You two are one determined team. Can wait to see how you transform the china cabinet! The brick wall looks great! Can't wait to see more. Oh Kris it looks WONDERFUL lady! I am so happy you were inspired to create your own version. I can not wait to see what this space looks like with everything put in place. I already loved how it looked before so I can only imagine how fabulous it will be when you are done. This looks so awesome, Kris! We have a real brick wall at our lakehouse...and it is an ugly pink. I so want to paint it, and you have so inspired me to do it! I can't wait to see the hutch in the finished room! You are a great team! OMG. I can't believe all the work you did on that wall. It turned out so good. You would never know that it wasn't actual bricks. You and Terry make a great team. So looking forward to see what you do to the hutch. Good project while the weather is bad and you can't do anything outside other than shovel snow. We are actually having rain - yea. Kris, that is one beautiful wall! Your hard work was so worth it and thank you so much for sharing that tutorial! Looking forward to seeing the rest. Oh my gosh Kris! You amaze me. That was a ton of hard work and you guys did an awesome job! It looks so real. And it's a beautiful backdrop. My China cabinet has mirrors and I've wondered if I can take them out. I look forward to seeing how the cabinet makeover goes. You have definitely inspired me today! Have a great week! Kris, I loved your kitchen before and couldn't imagine how you could improve upon it. Wow! The addition of the brick wall is amazing! 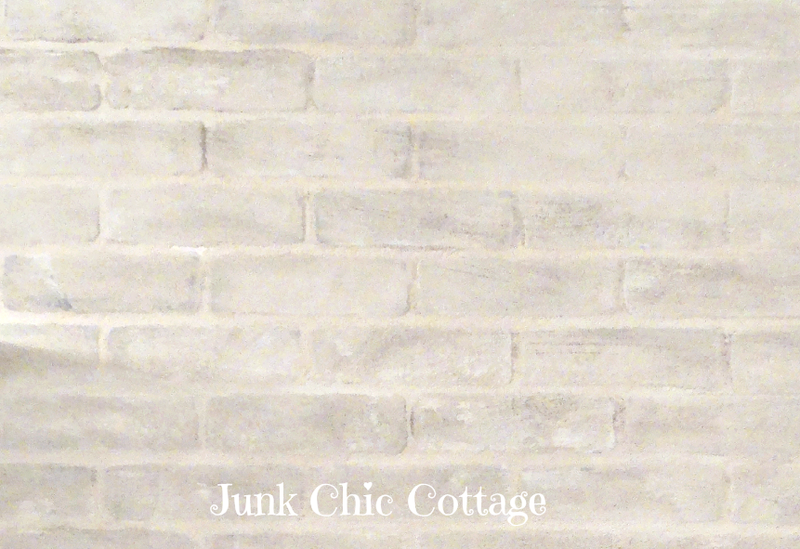 It looks like an authentic brick wall you would see in a French farm house so mission accomplished! You and Terry are a fabulous team! the tutorial is comprehensive and very easy to follow. The wall adds so much natural texture and interest. 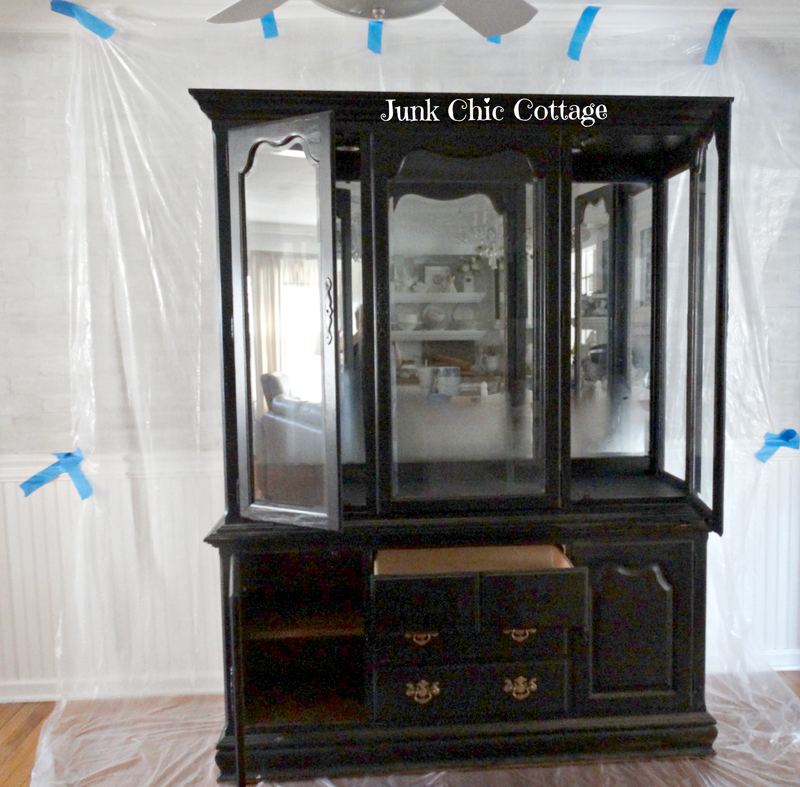 Can't wait to see the after and the transformation of your china cabinet! Amazing job! The tutorial is wonderful and the wall looks fantastic. I'm very curious to see the next. I'm speechless Kris. A lot of work but so well worth it all. It turned out amazing. Can't wait to see it all styled-up. Have a great day. Wow Kris you'd never know it was faux brick sheets! I can't wait to see how you style the wall and transform the hutch. Wow! that is a great look! I enjoyed reading the tutorial to understand how you got it to look the way you did. It looked like a lot of work though. Can't wait to see the final reveal soon! I have been waiting for this Kris and it looks fabulous!! This is exactly what I have been looking for to do in our Kitchen and attached eating area. Thanks so much for the Tutorial it is perfect!! Can't wait to see the Hutch! Wow! Y'all did a WONDERFUL job! You two work so well together. You did a lot of work and it turned out so pretty! I've always loved the look of brick walls. Can't wait to see the china cabinet transformation! Wowza-what a lot of work but it is stunning! great move in the right design direction Kris, it added so much more to the rooms appeal.... It looks so EUROPEAN brocante chic. I hope you don't hang so much that it hides all the beautiful work you created for your space and the attention your going to get from its outcome. Just amazing....I really like the heaviness of the layers of whites, really ructic looking in the best possible way. I had seen Pams way back when, and pondered a area of my home over doing some wood.... Now you gave me something new to really sit down and consider. You have a dinning area to love, and perhaps never leave the room because it may end up being your most favorite muse of inspiration. WOW girl this is amazing, LOVE it!!! Isn't having a handyman in the house to help with big jobs great. The fun is John and I love doing these things together. We have fun. Can't wait to see the cabinet. Your touch will be awesome! You both are so busy. Just wanted to know how Terry was doing with his changes in life. Hope all is going well. I'm glad he has you to offer him emotional support. Wow you are a busy couple. It looks like you've been working hard and I love the new look. Can't wait to see the black piece transformed. So many steps, you were so patient, but it was so worth it! It looks amazing. Wow. That looks fabulous! I really can't wait to see the rest of the reveal. Looks amazing...looks like real brick...great tutorial! Kris, WOW to both of you! That looks just fantastic!!! 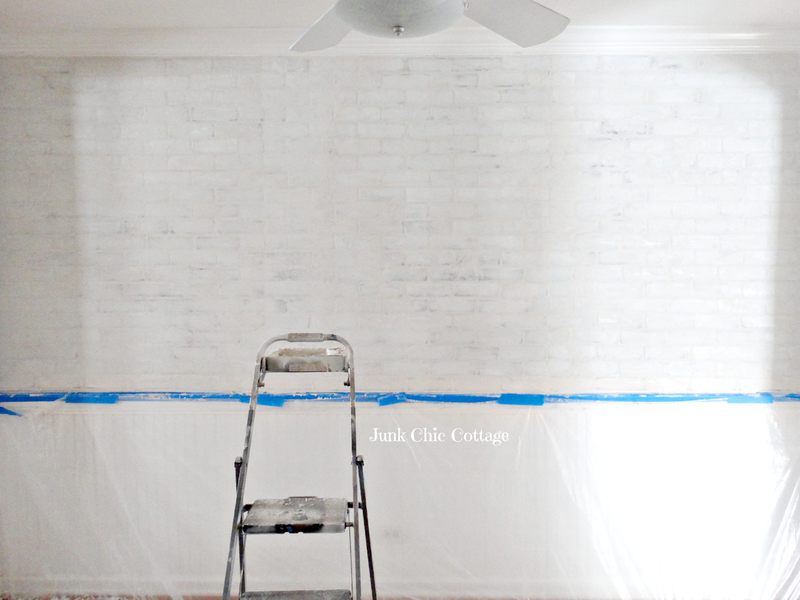 I'd love to have a white brick wall and will keep in mind, how you created yours. Gorgeous job! Thanks so much for sharing! Wow! Look amazing! Can't wait to see how you transform the hutch. What else can I say? You guys ROCK!! WOW. Great idea, great job, just wonderful. Oh you tricky girl. I so wondered how you were going to live with a colored wall. lol! I should have know better. Looks fabulous! 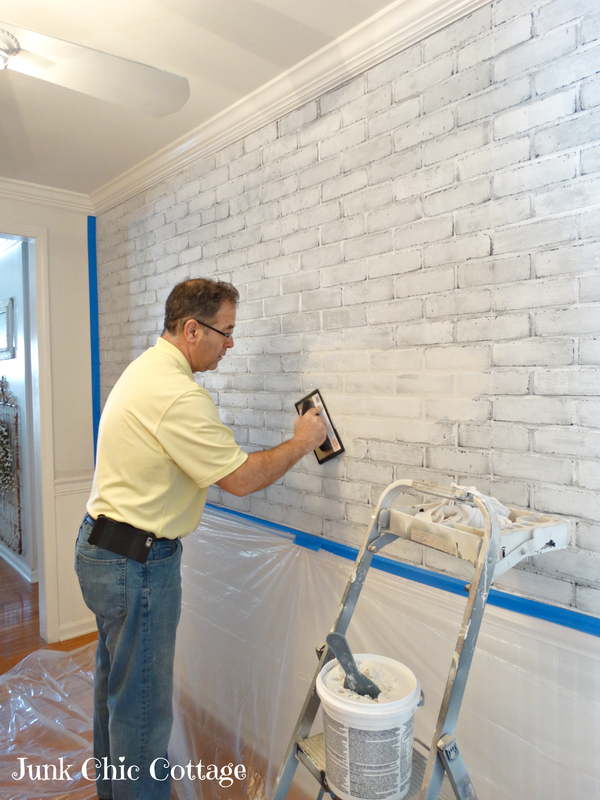 Kris, The wall looks wonderful and it is perfect for your beautiful home. Happy Thursday, Thank You's and Stay Tuned! Happy Sunday Hugs and Thank You's!